Alterna Bamboo Smooth Kendi Oil Dry Oil is an ideal product for styling hair and taming even the most unruly wisps. If you like wearing buns, braids, weaves or invent complicated hairdos, this oil is for you. It will help you in your daily styling. Try it and you will see its brilliant performance. What are the effects and properties of ALTERNA Bamboo Smooth Kendi Oil Dry Oil? Thanks to the consistency of the cosmetic, it can be used as an intensive treatment or a styling product. The best effects will be visible on thin and medium length hair. 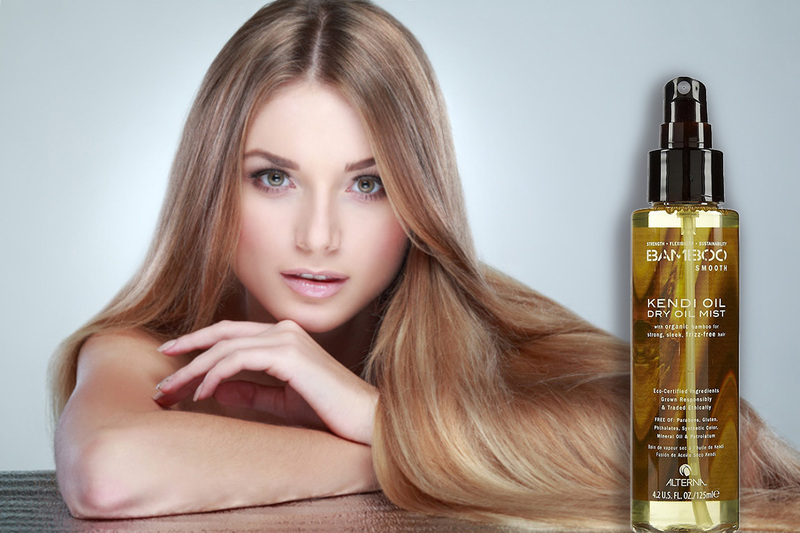 ALTERNA Bamboo Smooth Kendi Oil Dry Oil prevents static and frizz. It makes hair smooth, silky and shiny. Moreover, oil protects the strands from the heat and facilitates styling, drying and brushing. Additionally, it restores split ends of hair, deeply nourishes and strengthens. Protects against harmful sun radiation, humid air. It has a very lightweight formula that does not burden the strands and does not cause oily scalp. ALTERNA Bamboo Smooth Kendi Oil Dry Oil contains bamboo and kendi oil. The first one has regenerating and reinforcing properties. Prevents hair loss, provides flexibility, moisturises and nourishes. It contains substances with antioxidant and protective effects. While kendi oil is rich in unsaturated fatty acids. They are nourishing, soothing and regenerating. What is more, they protect against UV rays and other harmful factors coming from the external environment. How to use ALTERNA Bamboo Smooth Kendi Oil Dry Oil? ALTERNA Bamboo Smooth Kendi Oil Dry Oil can be used as a cosmetic designed for intensive treatment or as a base for styling. Oil has the form of a mist, its texture is very delicate and lightweight. All you have to do is to spray your hair from a distance of about 10 cm. You can as well apply the product on the palms of your hands and rub in damp or even wet hair. This way you will smooth out your wisps, and ensure their shine. Be careful, do not let the oil get into your eyes, because it could cause irritation. Do you know where to buy ALTERNA Bamboo Smooth Kendi Oil Dry Oil? You can find ALTERNA Bamboo Smooth Kendi Oil Dry Oili in major drugstores and perfumeries. Oil is also available online. You will definitely not have any troubles with purchasing this product. If you have not made your decision yet, find out what other girls say about the cosmetic. Simply browse forums and blogs and read reviews. ALTERNA Bamboo Smooth Kendi Oil Dry Oil is a relatively expensive cosmetic, therefore, not every one of you might be convinced to purchase it. What is the best about this oil is the original composition. Bamboo and kendi oil work really well on both hair and scalp. At the beginning of the treatment you will notice that your hair is stronger and less prone to mechanical and chemical damage, as well as more nourished and moisturised. Moreover, the use of ALTERNA Bamboo Smooth Kendi Oil Dry Oil is so easy that you will not be able to wait for the next application. After all, using a pump spray is very convenient for each of us. Shine, reconstruction and facilitated styling are the basic properties of this oil. If you are a fan of extravagant hairdos and at the same time you want to have healthy hair, then try out ALTERNA Bamboo Smooth Kendi Oil Dry Oil. The amazing results of the product are confirmed by many, very good reviews. If you know where to buy this cosmetic, do not hesitate; only the price may discourage you to purchase it.